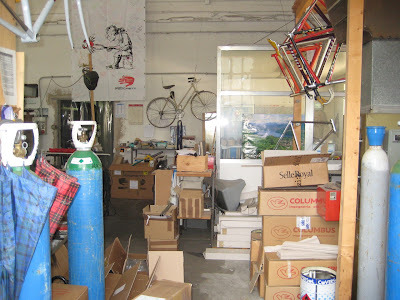 One of the great highlights of my time in Italy was my visit to Dario Pegoretti's workshop in Caldonazzo. I have been riding and racing my Pegoretti 8:30am since December, and have developed quite an attachment to it. Going to its "birthplace" and meeting the builder himself was a beautiful experience. 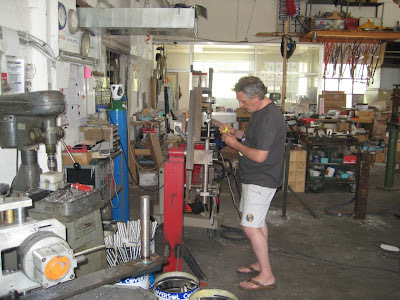 Dario works with two other gentlemen in an airy workshop filled with the smell of espresso and metal shavings and the sounds of miters and welders and very very loud Philip Glass music. Frames, new and old, are scattered everywhere. 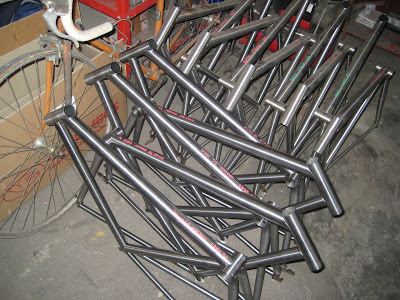 I can't tell you how many people asked me to check on the progress of their frames when they heard I was leaving for Italy. Here are about a half dozen Responsoriums making their way through the construction process. Yes, that is a mature layer of dust settled on the top-tubes. No, I don't know when they will be ready. 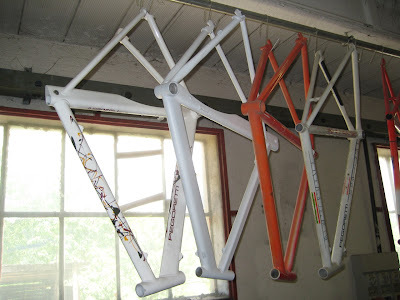 The oft-discussed Pegoretti Time Trial frame hangs here in two iterations. "Custom only," said Dario when I asked if he still built any. 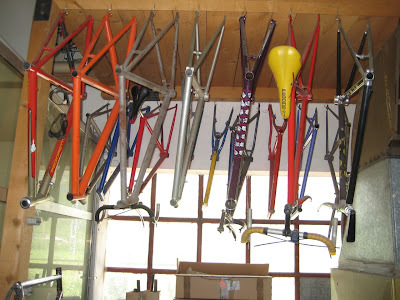 Some examples of Pegorettis through the ages hang from hooks in the entry-way. 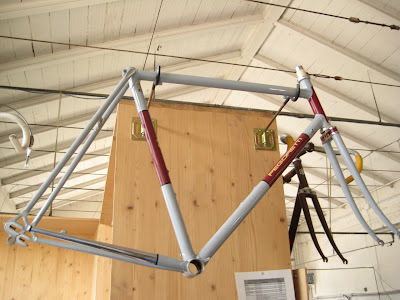 Here Dario is repairing a busted Luigino frame. 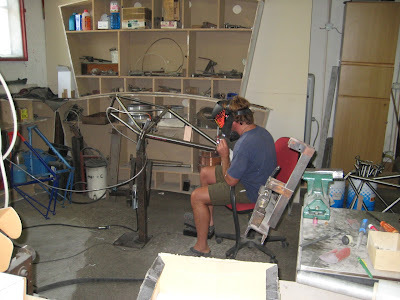 The top-tube was dented and bent, so he simply cut it out and is putting a new one in. Aside from Calfee's patch-jobs, I've never heard of such a thing happening with Carbon Fiber. [addendum: our friends at Parlee have reminded us that they can completely replace any of the tubes on their Z1, Z2, or Z3, without patches and the result will be flawless, like-new condition. Just another reason why we love handmade. Thanks Tom!]. Pietro, or "Perro," helps out with the welding. Perro prefers listening to Dire Straits, and the cacophony of the soaring rock ballads mixed with syncopated minimalist classical symphonies coming from the other room made for a rather unique audio experience. Somebody left this note over the kitchen doorway. I couldn't agree more. Now, we love Pegoretti bicycles and we love Pinarello bicycles. But that doesn't mean that Mr. Pinarello and Mr. Pegoretti necessarily love each other. In fact, any of you who know the history of the two companies are aware of the emotionally charged beginnings of the Pegoretti brand. 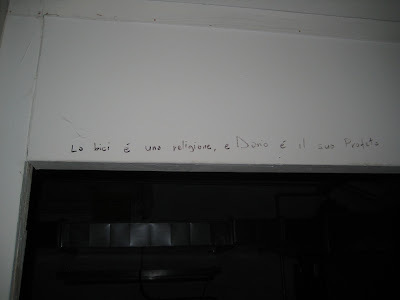 Suffice it to say that decades later Italian passions still run hot. Case in point: Fausto Pinarello visited Above Category here in California and saw our Pegorettis intermingled with Pinarellos and couldn't help but let fly with a good-humored quip. Dario and Pietro met up with the crew from Gita for dinner. Dario has been in need of a new computer for all the graphics work he's been getting in to. Giorgio from Gita arranged a custom laptop for him from Utah, and brought it to hand over to Dario. The computer was a monster. 600 GB of storage space, extra fans, special processors... needless to say it weighed a LOT. When Giorgio passed it across the table Dario took it and let the weight of the machine yank his arm down hard. "What have you brought for me..." Dario asked, "...a Pinarello frame?!"